THANK YOU Access Community Health Network for hosting our event in such a beautiful facility. 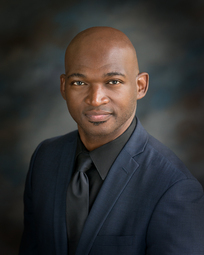 Dr. Karriem S. Watson, DHSc, MS, MPH is a Research Scientist with the University of Illinois Cancer Center. 1. Discuss the role of health care executives in advancing diversity in clinical trials. 2. Examine the NIH Precision Medicine Initiative and the opportunity for diversity in clinical research. 3. Describe practical steps for health care leaders to collaborate with community and academic partners to advance research. When Donna Thompson joined ACCESS as Chief Operating Officer in 1995, she understood the difficulties underserved patients faced. For more than 30 years, Donna has been on the frontlines of patient care delivery. Named ACCESS CEO in 2004, Donna has demonstrated a commitment to quality, affordable health care and understands its role in saving lives, revitalizing communities and promoting healthy living. Dr. Karriem S. Watson, DHSc, MS, MPH is a Research Scientist with the University of Illinois Cancer Center and the Director of Community Engaged Research for the UI Cancer Center at UIC and the Mile Square Health Center, a group of Federally Qualified Health Clinics (FQHCs) affiliated with the University of Illinois Hospital and Health Sciences System. ​Dr. Watson has a Doctorate in Health Science in Global Health and a Master of Science in Basic Medical Research and a Masters in Public Health in Community Health Sciences. Dr. Watson’s work in the Office of Community Engaged Research and Implementation Science (OCERIS) at the UI Cancer Center has supported the role of the UI Cancer Center as one of the country’s first community focused cancer centers by fostering access and awareness to community based cancer screening, education, prevention services, survivorship support and clinical trial engagement. Dr. Watson sits on several national and local boards all dedicated to strengthening community capacity as well as youth development to foster the engagement of youth in careers in science, research and health care. His work to increase the number of under-represented youth who engage in STEM careers and research afforded him recognition by the Chicago Urban League as an “Innovator in STEM”. His, work to support community based breast cancer screening and navigation afforded him recognition by the Metropolitan Chicago Breast Cancer Task Force as a “Community Champion”. His passion around ensuring underserved communities have access to screening and prevention services stems from his early experience with the death of his mother from breast cancer when he was seven years of age. Dr. Watson has taken his lived experience and used his passion to develop programming, research and interventions aimed at ensuring that underserved communities have access to state of the care that leads to early detection and improved outcomes. He has a passion for teaching that is displayed in various settings from community clinics to faith based settings and in classrooms at DePaul and Northwestern University where he serves as Adjunct Faculty. His work in faith based communities has also afforded him the opportunity to serve as a key advocate for the use of faith based partnerships to advance cancer screening and early detection and survivorship support and generalized health screenings. Dr. Watson’s work at both the UI Cancer Center and the Mile Square Health Center has resulted in the creation of community based cancer screening, prevention and navigation programs for breast, lung, colorectal, cervical and prostate cancer. ​Dr. Watson is also the Core Co-Lead of the Community Engagement Core for a $17.5 million 5 year NCI funded multi-institutional grant with the Robert H. Lurie Cancer Center at Northwestern University, the University of Illinois Cancer Center and Northeastern University to address cancer disparities in Chicago, he also serves as Co-Investigator for a $1million 4 year NCI funded grant to develop a partnership with the UI Cancer Center and Governors State University to increase the number of faculty and students from underserved communities who engage in cancer disparities research. Dr. Watson is also a Co-Investigator of the Illinois Precision Medicine Consortium which is one of four health provider organizations that was funded by the NIH Precision Medicine Initiative.